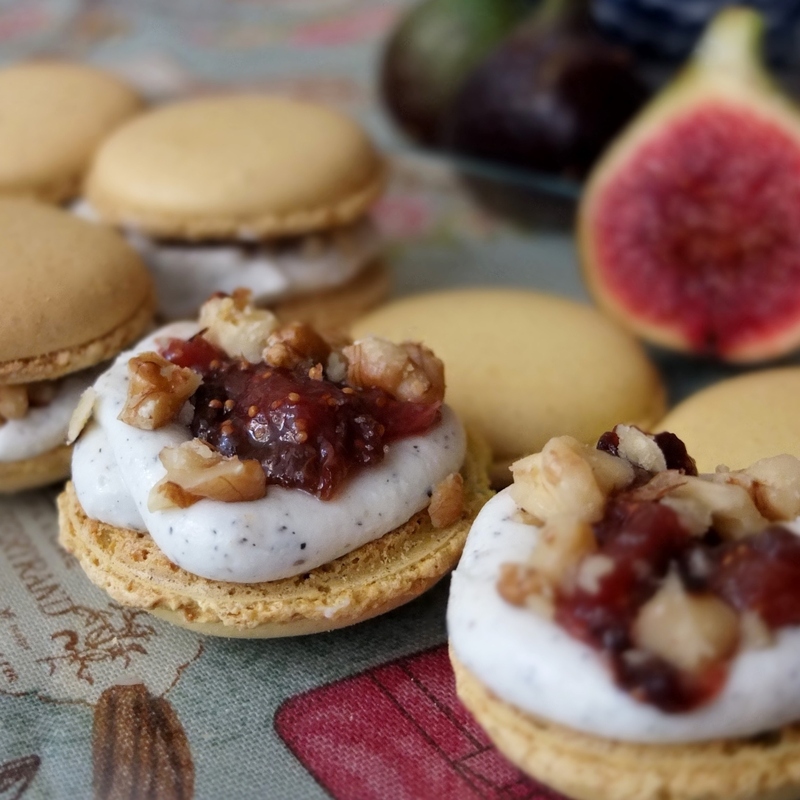 Savoury goats’ cheese macarons with fig, walnut and black sesame! 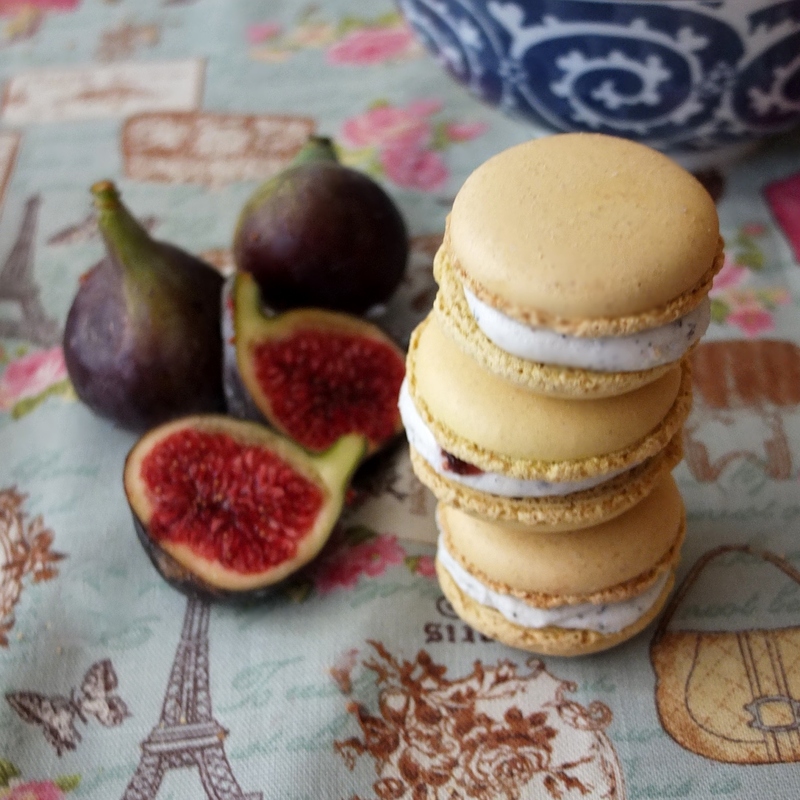 These strangely delicious tangy-sweet-smooth-crunchy macarons are a home-kitchen invention! 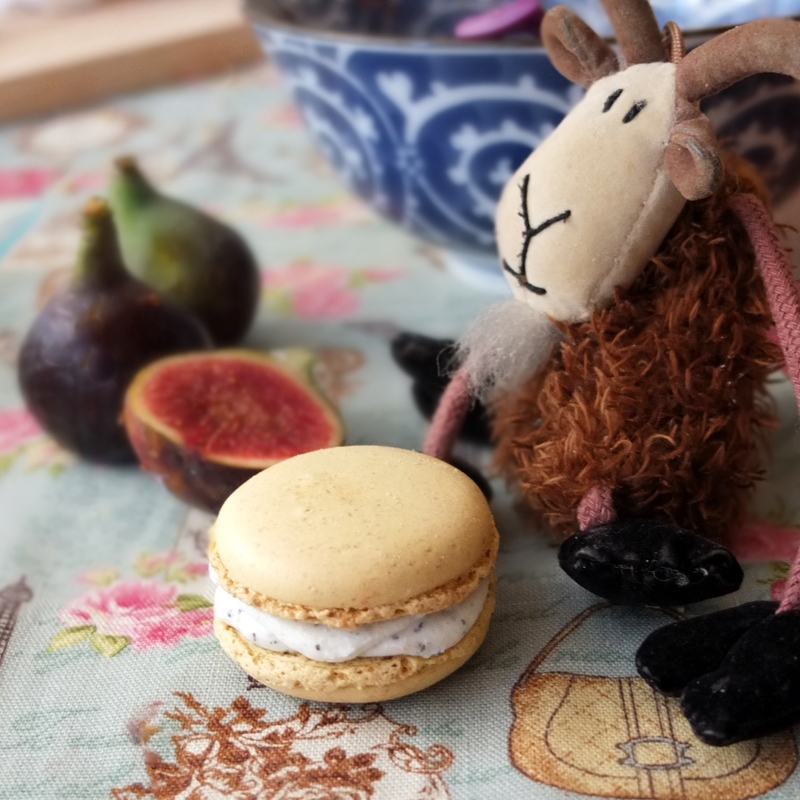 Your contribution to goats’ cheese macarons research would be greatly appreciated If you could also test them and let me know which filling combinations work best for you. Use macaron shells hanging around your freezer or make them. You can follow my Italian meringue macaron shells recipe (my preferred more stable method) or the French meringue macaron shells recipe. Allow the shells to cool completely before filling. Chop 1 or 2 figs into very small pieces and heat gently in a covered heavy-based pan for 10-15 minutes, stirring occasionally. Your fig compote should be soft and the flavour more intense. Pour into a bowl and let your compote cool in the fridge. Options: instead of figs you could try using apricots. pears, blackberries or raspberries, all of which can pair well with goats’ cheese. Use a disposable piping bag and plain medium-sized nozzle (no.8) to make a ring of goats’ cheese cream on half your macaron shells. Then add a quarter to half a teaspoon of fig compote in the middle of each ring. Sprinkle a few small walnut pieces on them then top with the remaining shells. These macarons won’t keep very long and should be eaten within 2 days. By day 3 you can still eat them but the shell will be softer. You could keep the prepared goats’ cheese cream separate and fill when required. 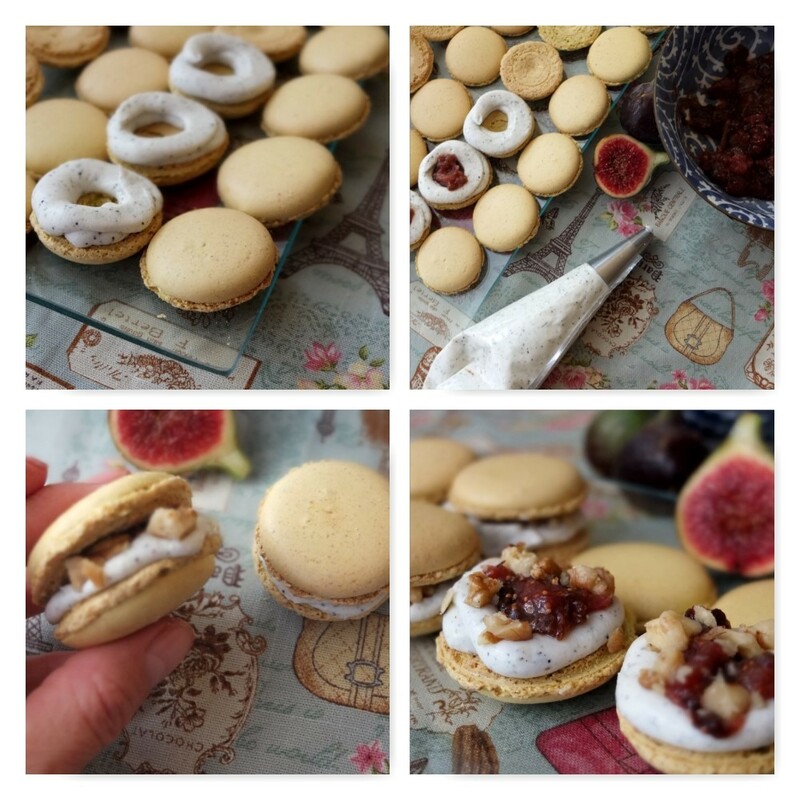 I hope you’re intrigued by these ‘savoury’ macarons and might try some out. I also highly recommend, as do my friends and family, my mojito macarons. 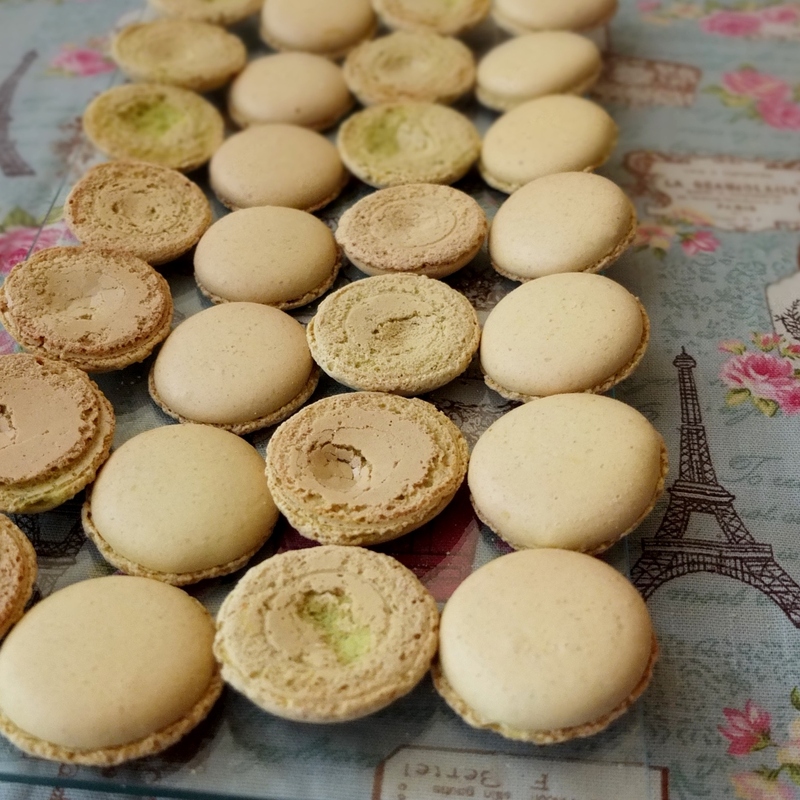 I’m just going to thank Rachael from pizzarossa and Korena from Korena in the Kitchen for motivating me to make macarons again with their Daring Kitchen challenge, where you can see lots of other macarons! I’m also sharing these tasty little bites with Perfecting Patisserie@bakingqueen74, Recipe of the Week@aMummyToo, Tasty Tuesdays@HonestMum and Simply Eggcellent@BelleauKitchen. Check out all their lovely recipes! And please help yourselves to a little goats’ cheese macaron with fig, walnut and black sesame seed. Aah Lili, perfection as always! Love the fog! You’re so welcome 🙂 Your treats are always perfection! Oooooooo I’ve been rather intrigued by savoury macarons but daren’t try them for fear of not getting the filling right. Lili, this is my first time here, and I love this recipe! I had no idea that macaroon shells were gluten free. You’ve made my day, my week! My daughter is 15 and she loves to cook, she has been wanting to make macaroons and now we will. I love figs, we both adore goat cheese, this is the perfect recipe! Thanks so much. Pinning so I have the recipe and so we can let you know how it goes!!! What an interesting combination! They look great!